Building an eco-friendly recording studio means considering where materials come from as well as their efficiency. 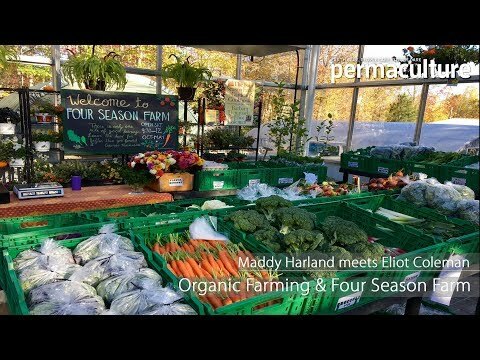 David Small explains how using recycled materials, energy efficient lighting and offsetting lumber by planting trees is one way to go. For years I've been dreaming about (and saving up for) building a recording studio. After some blood, sweat, and unanticipated costs, I just finished construction. It has been a wild ride bringing the vision to life - and I thought I would share what I learned along the way. I'm writing this article to help anyone who wants to build an eco-friendly soundproof room, which could function as a recording studio, but also a home theater, rec room, or just a super quiet bedroom or office. 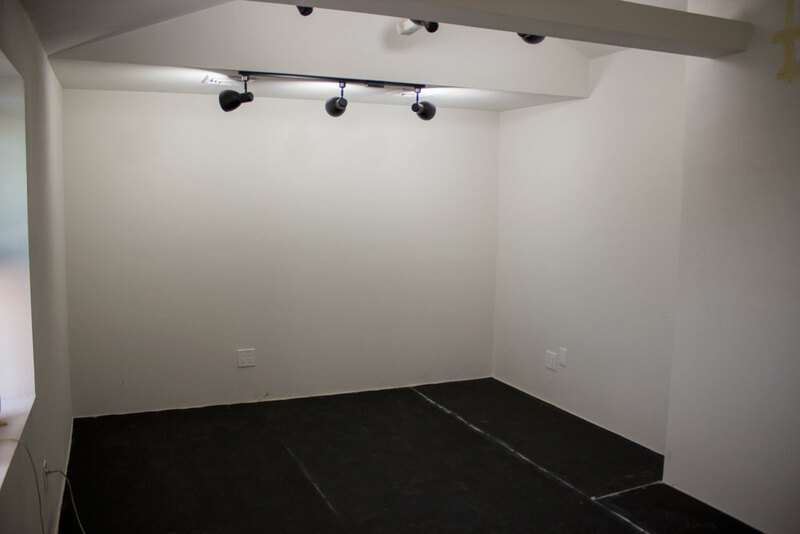 Building a recording studio is exciting, but also daunting. You're building a room within a room, which can almost double your cost and timeline. The hardest part is that your studio will only be as soundproof as its weakest link; you have to put equal focus into every part of the studio. If you care about the environment, then your other task is to build your studio using eco-friendly strategies and materials. While budgets and studio designs can vary greatly, I am focusing this article on elements common to any studio. My focus is on specific eco-friendly construction materials. I will explain why these materials are effective in isolating/absorbing sound and reducing costs. But also how the materials are sustainable and energy efficient. When building your studio, you need LOTS of insulation. The insulation makes the room energy efficient by retaining the indoor temperature, but is key in absorbing all the sound transmitting through the walls, which could reverberate within the framing structure. Through my research, the standard for studio construction seemed to be the Owen's Corning 700 series; however, I then came across Bonded Logic's UltraTouch Sound Control System. UltraTouch is made from 80% recycled denim i.e. your old jeans, which makes it a million times easier to work with than fiberglass, which is hazardous. UltraTouch also has some mass to it, which gives it 11 more STC (Sound Transmission Class) points over its closest competition, absorbing significantly more sound especially in the low end (which is really important). UltraTouch is also less expensive. 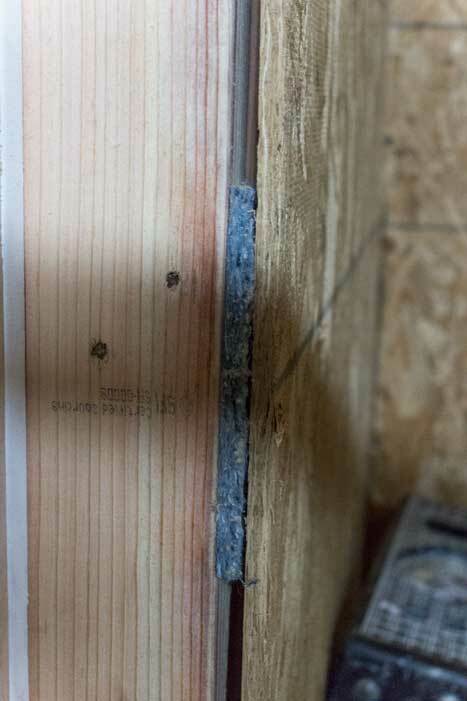 UltraTouch Sound Control Insulation Strips absorb sound vibrations that would transfer between the walls and into studs/framing, helping further isolate the inner room. UltraTouch can be purchased by itself, but it can also come in a Sound Control System, which includes isolation strips. The strips are stapled to the studs and help absorb vibrations that would transfer through the walls and into the framing structure. Buying isoclips with furring channels can be very expensive and also limits how much mass can be added to the walls, since all the weight is being held on furring channels. UltraTouch is available at Lowes, and also offered in bulk through Acoustical Surfaces. 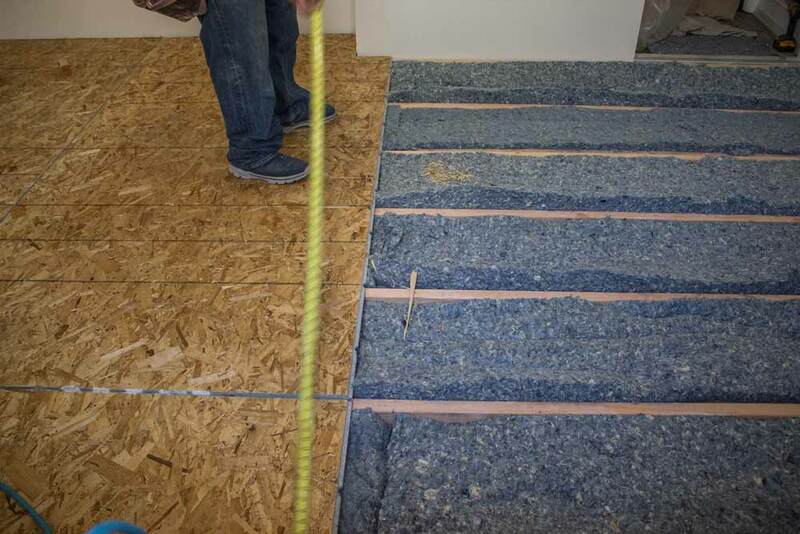 UltraTouch insulation can also be used in subfloor framing. Bass frequencies travel mostly through the flooring and can cause buzzing that travels through corners and walls. 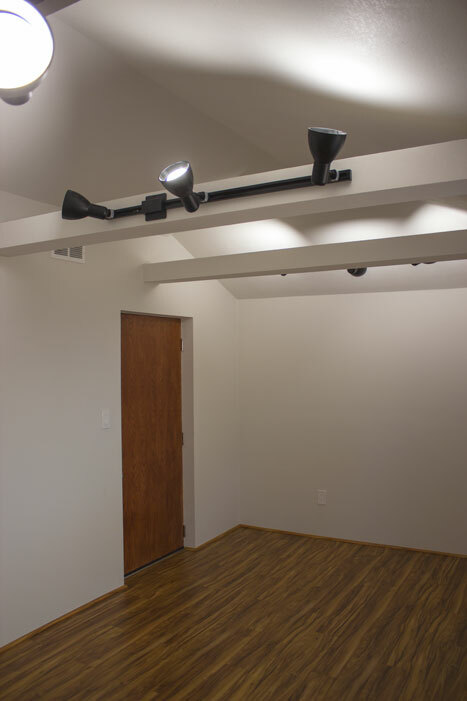 Some studios use neoprene or isolating brackets below the walls; however there is an eco-friendly product called Acoustik, offered by the experts over at Acoustical Surfaces. 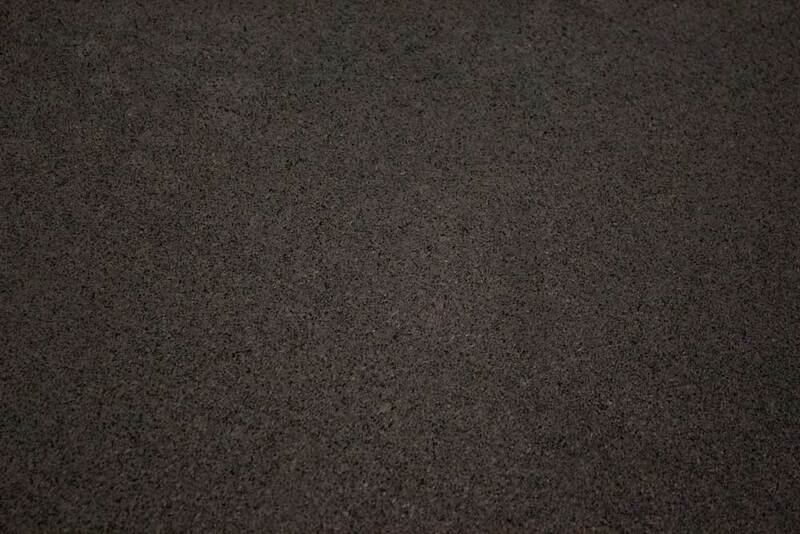 Acoustik is made from 100% recycled rubber and creates an effective vibration barrier, as a subfloor underlayment. When combined with an acoustical sealant, creating a 1/4" membrane around the perimeter, sound vibrations are absorbed and stopped from vibrating into the walls and framing. Acoustik is glued down to plyboard or concrete. Then most types of flooring can be laid on top. 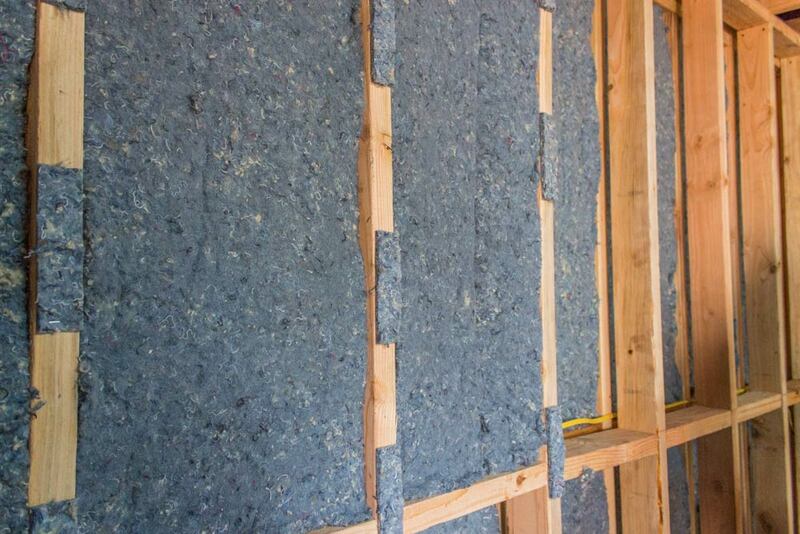 Acoustik Recycled Rubber Subfloor Underlayment from Acoustical Surfaces. Acoustik 100% Recycled Rubber Subfloor Underlayment - Close Up. One of the hardest decisions I faced building the studio was to include a window. I've worked in many studios with no natural light, and after a while it can get depressing, especially on a bright sunny day when you need to get things done, or when its raining and you want to be connected with the outdoors even though you can't get outside. I decided to add a triple pane window, with an STC of 54. Combined with acoustic curtains, I can't hear any outside noise. By including a high STC triple pane window, you get natural light during the day, but energy costs are also cut since you don't need as much powered lighting. Just note that a triple pane window will probably be your biggest cost. When looking for energy efficient LED lights, I came across Ilumi. Ilumi creates smart LED light bulbs that are super energy efficient, last twenty years, and can be controlled with your smartphone. 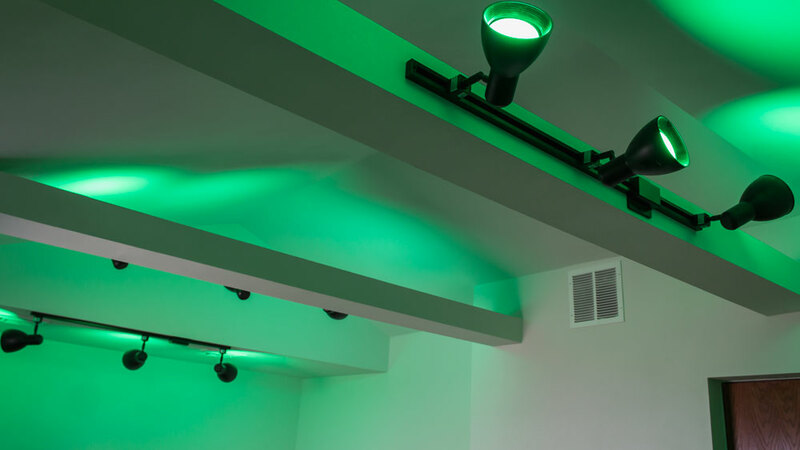 The BR30 fits in a standard light bulb socket and provides a wide, but at the same time focused, spotlight that can be turned into any color combination and scene layout. The bulbs can also automatically turn off when you leave the room, and be put on a schedule throughout the day. To save floor space, I added the bulbs to track lights, but they can be put on floor lamps as well. Ilumi Smart LED Flood Lights - BR30. Energy efficient light bulbs controlled with your smartphone. To offset the lumber used, I am planting trees through TreePeople. For 42 years now, TreePeople has been planting over two million trees throughout Los Angeles, beautifying the landscape and bettering the environment.5 Each $25 donation goes towards planting and maintaining a tree, as well as educating volunteers about the process. The products I used effectively isolate and absorb sound vibrations with high STC values, add energy efficiency, and/or are sourced from eco-friendly materials. To learn about powering your studio with green energy and Making an Environmentally Friendly Vinyl Record check out my article and video. Please join my fan email list below and feel free to reply back to your confirmation email with any questions! Thanks for reading. Done! No noise from outside can be heard, but the next step is treating the walls. Sound on Sound has a great article about environmentally friendly materials that can be used to treat the inside of your studio, to create a great tracking/mixing space. Piuma (py-ooma) is a progressive funk rock band from Los Angeles, California. The next record is now being written and recorded in the new eco-friendly recording studio. The self-titled five song EP received press from The Vinyl Factory, Modern Vinyl, Collectively, A Journal of Musical Things, etc., and is in stock at top LA record stores like Amoeba Music, Vacation Vinyl, Stax of Wax, and Permanent Records. International vinyl record distributer Vinylmnky now features signed copies of Piuma’s EP as one of their Spotlight Albums. Pandora compares the record to The Black Keys. Piuma’s live recordings of As Far As the Eye Can See and Beyond the Bubble recently premiered on Relix and Songwriting Magazine. 4. Unfortunately, Roxul does not provide STC ratings; however they do provide their NRC ratings. STC measures the absorption between rooms, whereas NRC measure the absorption of sound that would be reflected back into a room. The first step in constructing a recording studio is to block sound from entering and exiting a structure. For this reason, STC is a useful measurement for determining what materials should be placed inside the walls. Once the studio is completed, the next step is setting up treatments within a room to absorb sound being reflected. For comparison, an NRC chart is below. NRC stands for Noise Reduction Coefficient, reflecting the percentage of sound waves which come into contact with the sound absorption materials and are not reflected back into the room. NRC values measure the absorption of sound that would reflect back into the same room. An NRC rating does NOT measure how well a material can block sound. The NRC rating for sound absorption materials ranges from 0 (perfectly reflective) to 1 (perfectly absorptive). Test method: ASTM C423 - Type A.